We go to Italy every winter, and my husband’s mother has a bingo party on Christmas. Every woman brings a dish: lentils, cavolo nero, tons of beans, polenta, every type of cheese, bruschetta, fresh vegetables, and local olive oil and wine. 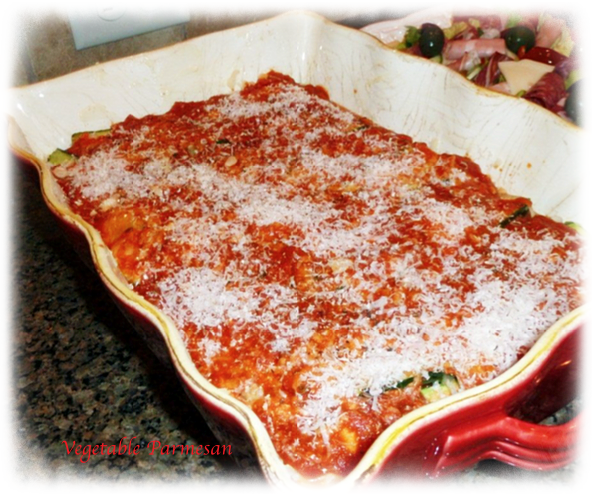 Maybe a new lesson in life to have great dinners during your Christmas and Thanksgiving celebrations and get out of a rut, serve wonderful dishes that you love, and give up the full on crazy…I have made this fabulous vegetable parmesan several times over the years, always a wonderful dish for a crowd. While it is fantastic if you are lucky enough to get farm fresh veggies during the summer months it is just as good for a winter holiday dinner and especially for an Italian Thanksgiving or Christmas dinner…I think that it will find a way to my table during the Christmas or New Year’s holidays since I am always looking for family and crowd style dishes these days. It is not unusual to see this served anytime at my house on a smaller scale of course. I prefer to grill the vegetables and use a homemade sauce, but feel free to use your favorite store or market brand and as she suggests, grill other vegetables, I love the addition of grilled Portobello mushrooms and a little grated provolone mixed in with the mozzarella. Serve with a fabulous antipasto salad, lets of garlic bread and a good bottle of wine. I forgot to butter the pan and it made no difference. Brush the vegetable slices with EVOO and season with salt and pepper, grill until they have some nice grill marks and are slightly softened, 3 to 4 minutes each side. Follow Giada’s oven roasting method in her recipe. Spoon about 3/4 cup of the marinara sauce over the bottom of the dish. Arrange the eggplant slices on top. Sprinkle with 1/3 cup of each cheese. Layer fennel slices add 1/3 cup cheeses and 1/3 sauce. Arrange the zucchini on top and add the last of the cheese and sauce. Scatter the bread crumbs over the cheese and drizzle with EVOO. Bake until the top is golden and forms a crust, 30 to 35 minutes. *My changes to Giada’s recipe: For an additional layer, clean Portobello mushrooms, remove dark gills, brush with EVOO, grill and season with a little salt and pepper. Use 2-1/2 cups grated mozzarella and ½ cup grated provolone. Seasoned bread crumbs instead of plain.